Yesterday was my first Sunday back at church. Since my mastectomy four weeks ago, I've not been physically able to attend. I am blessed to have a very wonderful church family. We truly are like a family; and when I got diagnosed and went public with my cancer, they were there, praying for me. I was excited and a bit scared about returning. The scariness lay in the fact that we all missed one another, and that would warrant hugs, and hugs might be a bit painful yet. So I had it in my head that I was going to approach with the left shoulder leading, hug with the left. : ) It's always good to be prepared with a strategy. It was great to be back. I had a two-fold reason for wanting to go back this Sunday. 1. I wanted to give thanks to God for the blessings of health; my surgery going well; the road to recovery being "so far so good." 2. It was my nephew/Godson's last Sunday at church before his move to AZ to pursue his Masters in architecture. So...I got ready. Getting ready I realized, once again, that I am down on myself. My midsection is still swollen and I feel puffy. I haven't been able to bend much, and the walking has been good one day, pay back the next. My weight has been up since the surgery, and though my daughter and sister tell me that it's early yet, that it's only been a short time since the surgery, I want it all to be "normal" again. I'm impatient with myself. So there I am, beating myself up....and we go to church. We pull up, and Sonig is outside. She saw me get out of the car and came running up with open arms to softly hug me. I walk into church, and my "me" disappears, and it's just so great to be back. It's like a family reunion. As I'm walking to my seat, I see smiles from friends. It was great to be back in choir. It was great to smell the familiar sweet incense; to see my family serving on the altar, and to worship with my church community. When we gave the kiss of peace, it was so neat to hug my sister Susan, my friends Anoush and Lusine and great them with the message that Christ is revealed among us! After church, we had a small send off for my nephew who has been our church organist for the past three years. That was bittersweet. I'm excited for him because I know he will excel in his studies. He's brilliant. And I'm sad because we'll all miss him, his smile, his music, his creativity. Hugs were met with my "soft hugs" admonishment, and all went "pretty well." : ) My homeless outreach partner in crime, Suzie, told me at least three times that she was so happy to see me, and I just felt really blessed. One of my friends came up after church and said, "I was praying for you and then I opened my eyes and you were here." Reggie came up and told me she started crying when she saw me walk in because she had thought of me and prayed to see me. Koko, my friend from our homeless outreach said, "I was starting my prayers praying for you....and then I was ending my prayers praying for you....and lately have I started and ended my prayers praying for you." It's hard to convey how much this all means to me. I know that I am where I am today....a survivor...because of God's grace, because of these very special prayers from my family/friends, and because of the belief (theirs and mine) that these prayers will be answered. And they were. To all of you out there who are praying for me...I want to thank you from the bottom of my heart. I truly believe that I could not have done this without your support, your love, and your prayers. I love you all! My dear friend Sylvia put out a request on Facebook this evening for an Anoushabour recipe. I shared my mom's recipe with her...and thought I'd share it with all of you. For those of you who aren't familiar with Anoushabour, it's an Armenian fruit dessert that's made with skinless whole wheat berries, dried apricots and raisins and decorated with almonds. 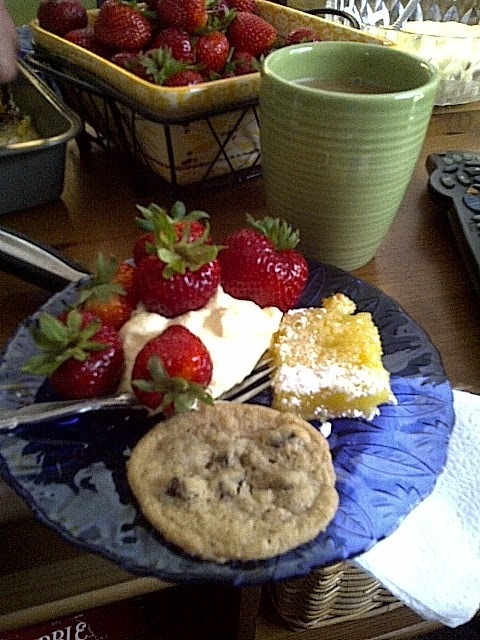 Traditionally, it's a holiday dessert, but anytime is a good time for it. Okay, my mom's anoushabour is more like a thick apricot pudding, so i'm going to give you her recipe, and another that I found in one of my cookbooks. Wash and drain wheat. Add water to wheat and bring to a boil about 15 minutes. Then turn off heat and set aside 2-3 hours until it swells/softens. Chop the raisins and apricots (food processor is best for this). Add fruit to the wheat along with the sugar. Cook on low heat until thickened (about an hour) stirring frequently. It will thicken further as it cools. Pour into a large serving dish (like a casserole dish) and decorate with blanched almonds, walnuts, raisins, pomegranate arils, etc. (My mom doesn't add cinnamon, but I do. If you want to keep the color light, you can use cinnamon oil...otherwise, add cinnamon after cooked to taste). Serve warm, cool or room temperature. It's Memorial Weekend. And it's been a few days since I blogged. Life has been fast and slow. There are times when I feel "normal" again, walking, creating, working on various projects. And then there are times that I just don't want to do anything: I don't want to talk, I don't want to get dressed even. My abdominal incision is feeling a lot better, but there are times when I am so sore under my arm, on the new breast, across the middle where they tunneled. The good thing is that this usually happens at the end of the day, when my body gets tired and yells out , "Enough already! Take it easy, wouldja??" Yesterday, I spent most of the day with my brother and sister-in-law Susan. I had a great day. We went out walking, smelling the pine and jasmine in their neighborhood, checking out the pets at the pet store. I got to see my two handsome nephews (the third handsome nephew was in school), and it was just a very relaxed time with family. We are so close, but life is so busy. We don't often get to just spend time together -- where it's not a birthday or holiday, but just quality time. It was really special. So here we are, Memorial weekend Saturday. I listed my new jewelry on Etsy. It's one o'clock in the afternoon and I'm still in my jammies. Taking it easy today. I do need to get out a little, but not for long. I'm saving my energy for tomorrow. I'm hoping to make it to church tomorrow....my first Sunday back. Yesterday was a good day. I walked two miles in the morning, came home and sanded and shaped the silver pomegranates, was pretty good about my non-snacking goals (except for the afternoon Oprah sunflower seed extravaganza! ), and walked a third mile when my brother came to visit. It was bra day, and it felt good to have that extra support, to feel normal again. Today, not so much. : ( By evening, I was out of my clothes and into my jammies by 6:00. Just needed to do nothing -- after I torch fired the pomegranates (there's always something to do). It's hard to explain. I wasn't "sleepy" tired, but my body was tired...and complaining. My abdomen (which I didn't really feel had the right to complain since all we did was walk! ), was sore...like I had done sit ups all day. My new breast, after being loosely bound, was tender and achey. I haven't been taking pain meds for over a week now, but it warranted meds. "I" didn't feel like I was doing too much too soon, but I guess my body had another opinion. So this morning, I decided to forego the walk. Actually, my friend Sugar asked if I'd like to meet her for a walk in Montrose this evening, so I'll get in a short walk (emphasis on "short"). So it's a lazy morning (as far as exercise is concerned). I slept in til about 8:30. Made coffee and wire brushed the pomegranates that I had fired last night, and they are happily tumbling in the tumbler in the kitchen for the next few hours. And finally, this morning, I went out to put the sprinklers on the garden. It was just a few short weeks ago, pre-surgery, that I was turning the soil, adding organic mix to my terrible dirt, watering, prepping the garden and planting because I KNEW that I wouldn't be able to dig for a few months. Well, the garden is doing really well, and I thought I'd put up some pics to show progress. I have tomatoes, zucchini, yellow squash, chinese peas, green beans, cucumbers, bell peppers, eggplant and a sunflowers around the border of the garden. Nothing is harvestable yet, but it's looking good. I need to weed (as the crabgrass is coming in again, but I can't bend. So maybe I can do it with that little "grabber" tool that my mom bought me?? I wonder? I have bell peppers forming! The full view, sort of. with the new pepper and tomato plant that I'll ask Neddy to plant this weekend. Notice the sunflowers that are about 5" high all the way down the right and in the front bottom. We're just back from our morning walk. I was able to walk two miles this morning. It helped that Ani came along with me...which always makes it more fun. It's a good day. First of all, the thing that's "milestone" about today is I got to wear a bra!!! Sorry guys, I know this is not something that's important to blog about, but let me tell you, after surgery, this is a big deal. Those of you reading who have been through reconstruction, breast cancer, mastectomy, etc., you know what I'm talking about it. So the doctor gave me the okay for three weeks out...and I'm here! Another milestone! So anyways...back to the walk this morning. I'm amazed at how strong I am. Truly. I mean, just three weeks ago, I had my surgery. I'm still sore, yes, but I walked two miles this morning and I am pretty sure that I could go further. I know, I know...don't push it. But I don't feel like it's tiring or straining. It actually makes me feel better (mentally/emotionally). And it's great to see that life is going on out there, outside of my drama, y'know? Now this was really random. We were walking down a side street and came across this chalk outline. Some one has a leg of lamb for an arm!! You can see that some are smooth and some are textured. I'm going to do a resist technique on the smooth pomegranates. The textured pomegranates will have "seeds" hanging from them on the bottom. I'm going to dry doing a cold connection with those, drilling the holes in after firing with a tool that Ani bought me for Christmas. The loopy things are the bales that I'll attach to the back to hold the chain. This is what fine silver clay looks like in its unfired state. So today I'll sand, shape, do the resist, attach the bails, and maybe later on tonight I'll fire them. My daughter Ani leaves for her hospital rotations pretty early in the morning. I always like for her to tell me she's leaving (if I'm not up), and also to let me know she's made it to the hospital by texting me when she gets there. I know, I know...it's a bit overprotective, but it's what we do. Anyways, because I wrote that post last night, I was in the mode of "thinking" about taking a walk at some time today. When Ani left this morning, I looked at my blackberry at my bedside. 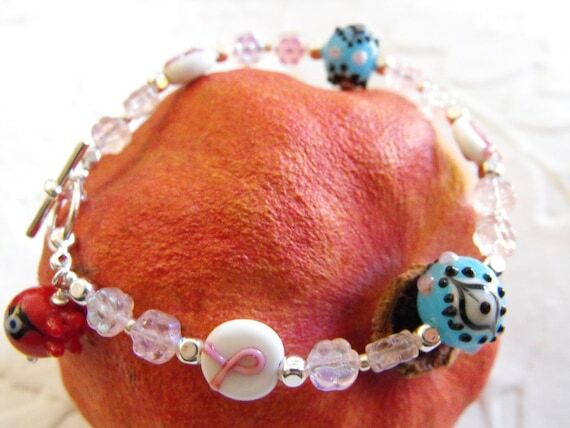 The usual email notifications, one more pink ribbon bracelet sale (thank you! ), and a "comment" on my blog post from my dear friend in Japan telling me basically to get off the couch....or even think about selling the couch...but basically a call to get up and out and get moving. So I'm lying in bed reading this...and another comment came in. This time on Facebook, from my friend Sandra. Another word of encouragement. So I didn't roll over and go back to sleep. I didn't wait for Ani's text saying she got to the hospital. I washed my face, brushed my teeth, put on my clothes and laced up my shoes. And off I went. I have to tell you, it was beautiful out. The air was cool and scented with jasmine that's blooming all over my neighborhood. And according to mapmyrun.com my first morning walk totaled 1.13 miles! Yay me. Tomorrow I will go further! Some very dead and not so beautiful yards...yellowed from no water? water shortage? or just lack of care? A car with a C-clamp clamped to its hood to hold it down while driving! A neighbor's fence made entirely of nautical spools? Round and wooden. Very cool. Thank you everyone for your encouragement and prayers! I am on the road to feeling better everyday! I get by with a little help from my friends! Here's the cool cactus flower! My neighbor, Dave's garden...always nice. That's my car in the driveway just beyond. This was as I was coming back home. You can see the foothills in fog in the background...sort of. I don't know what ths flower is but it's a huge, drought tolerant scrub. I had heard that it's called a Mexican Rose. It's really very showy and beautiful. I saw lots of roses with dewdrops. And here's that incredible wall of jasmine. As I approached it, there was no fragrance...and then about 10 feet into it, you get hit! and after you pass it, the fragrance hangs in a cloud beyond it. I can tell I'm starting to feel better because I'm starting to get critical about myself, (sad but true). It's been three weeks since surgery. I haven't been able to bend or move my right arm normally.....I haven't been able to exercise at all, and I can't do anything that would use my ab muscles because of the mesh that's healing inside me and the incision itself. Prior to surgery, about three weeks, I was rushing for tests, biopsies, appointments and exercise took a back burner to life and it's complexities. So it's been a couple months of no yoga. And in February, I had a colectomy (resection of the colon due to colon cancer). so no exercise then. And I'm starting to feel schlubby. But I need to do something. The inactivity is making me gain weight (7 pounds since surgery! )...that and the "being home" factor. The doctor says I am still swollen and that is the reason for the gain, and I feel that, yes. But I also feel more jiggly. Those of you who know me, now how hard I've worked over the past year and a half to lose weight, so you can maybe understand my panic. So tomorrow is Monday. The plan is to get dressed and take a walk. I don't know how far I'll be able to go, but I don't have to rush...I can take my time, but I've got to start moving again, and walking is something that I can do. Let the training begin! Since I've been blogging about my cancer, I've received comments and emails from people commending me for my "positive" attitude. I've been helping another friend through this terrible disease, and that has gotten me thinking about attitude, my feelings about cancer, and coping. I wanted to share because it hasn't all been positive...at least I haven't been. Cancer is not fun. In fact, it's downright scary. My first time around with breast cancer, I was 34 with two young children. I was NOT positive at all. In fact, when the surgeon told me that he recommended a double mastectomy, I was ready to say yes. I was not proactive at all. Moreso, I was one that just accepted her fate. My mom suggested a second opinion. I remember telling her no. "Mom, I have cancer! They want to do a double mastectomy. I've set the surgery date. I need to do this and get it over with." I was terrified, depressed, and all I could think about was living through it to be able to raise my children. My mom was the voice of reason. The woman of faith that she is, she suggested that I seek a second, if not a third, opinion. In fact, she threatened that she would be dragging me in my pj's if I didn't get up and get dressed, but we were going, and that was that. And I did. It was because of her that I didn't have to have a double mastectomy at 34. I had a lumpectomy and radiation thereapy, and was able to keep my breasts for another 18 years. That's what I needed at that time. Someone to take me by the hand - drag me if necessary - and tell me what to do! After cancer, after the therapy, I had that invincible high. I joined the ranks of "survivors" I was able to raise my children. Life was good. And I learned a lot from my experience. And I came to the realization that there was a lesson to be learned from everything in life. There is a quote from Mother Teresa that I found recently: "I know God will not give me anything I cannot handle, I just wish He didn't trust me this much." This ties in with the lesson thing. I don't think God gives us stuff like cancer to "handle", but I do know that He trusts us with getting through it so that we can learn from it...and carry the message of hope to others. So after the cancer, I became adamant about reaching out to others with cancer, doing the breast cancer walks, helping others going through it because I've been "entrusted" with the recovery and making it through....now we carry the message forward. I also learned a lesson in priorities. I have always thrived on chaos. My life is always "full" of too many things. But what cancer showed me back then was I needed to slow down. God had given me the gift of life and an opportunity to raise my children, and spend my days with family and friends. It was a gift and something that I needed to cherish every day. This thinking has stayed with me for the past 18 years. I still say "yes" to far too many things...that is just my nature, but each day is a blessing, and my family needs to always come first. Given: I want to live. I want to survive. I want to see Ani's graduation, her wedding....and someday, son Nareg's wedding (someday), my nephews and niece's graduations, celebrations. I want to see my children be happy, have families of their own. Okay, I knew this much. I am a woman of faith and given this, I know I am in good hands. God has NEVER left me alone...not through round one of breast cancer, not through colon cancer, not through my divorce. Those were major things. But He has also never left me alone through my day-to-day ordinary life: my jobs, my life, my financial troubles, etc. So why should I think that he would EVER leave me alone now, in my time of need? That wouldn't make sense, right? Right! So, knowing that, I just gave it all up to God. It made absolutely no sense for me to worry about my surgery. There's nothing I would be able to do about that part. I would just have to resign myself to know that I was in the capable hands of my surgeons, guided by God. What I COULD do is start focusing on the healing. I could visualize wellness, picturing myself getting a little stronger, a little healthier every day. I could put it in my head that I WOULD make it to Ani's graduation...and I currently visualize myself there, being present and well. 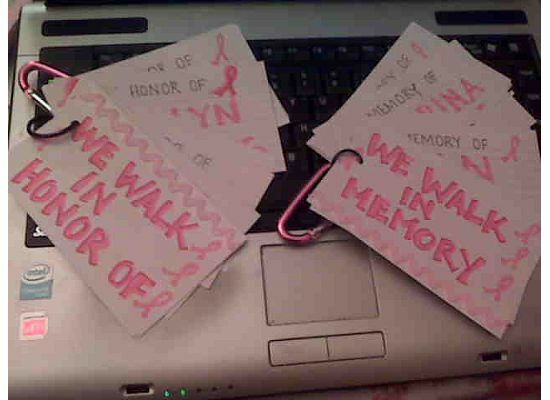 I can visualize myself as healthy, walking miles in the Avon Walk for Breast Cancer in September. The mind is an amazing thing. With the help of Christ, the healer of all, we have the power to be well! And finally, I've learned to think of my cancer as a positive rather than a negative. Since Round One really opened my eyes in respect to my priorities and my faith, I am viewing this as a positive. What lesson is there to be learned? Is it a call to slow down? A call to take better care of myself? To spend more time doing what I truly love? Or is it a reminder of how precious family and friends are? How we are all interconnected in one another's lives....and how much we are loved. Yes to all! It's a wake-up call! To all of us who have lived with cancer, or who are fighting the fight right now: Have faith. Believe. Trust. Learn. And then put on your armor and FIGHT!!! Yesterday I had my last drain removed. Yay! You don't know what a big deal that is as far as getting dressed. For the first time, I didn't have a tube sticking out of my waist, or a pouch hanging off my neck. Freedom! The drain levels were still a little high, but Dr. Berger felt we could remove it with a warning of, "If you feel like you're accumulating fluid inside you....or if you feel a sloshing inside your abdomen, you need to come in and we'll have to aspirate it." Ewww. I asked if maybe we should keep the drain in a little longer then? I don't know, the idea of having to aspirate fluid with a needle to the abdomen....not nice. But he felt it should be okay. So out it came. I could feel ever inch of the tubing as all 12" - 15" or so came out of my body. Terrible feeling. Not painful, just eery. Like a tail whipping through your body from the inside. They put a gauze over the drain site, told me it may drain on its own for a couple days and hopefully all will be okay. The advice was to go buy some compression undergarments to keep everything supported. I asked if I could drive. He said he didn't see why not since I'm no longer on the Vicodin, so I got the okay for driving. Not that I'm going anywhere, mind you....I still can't wear a bra (which means still can't dress normally), but the idea that I can if I wanted to, is good enough for me. And when can I wear a bra (now that we're on the subject). Starting next week. Why am I sharing this? In case there are any of you out there reading that are going through, or going to go through, you've gotta know, right? Okay, so three weeks out, I can start wearing a loose-fitting (circumfence-wise) bra. This is because the blood flow to the reconstructed breast has to remain good...so no tight-fitting clothing. I asked about the pain I've been feeling...the hypersensitive areas, and the numbness. Both are normal. He explained that my skin has been traumatized by the reconstruction, so the nerves are all regenerating, and the skin is regaining it's blood flow. The numbness is because of the extensive abdominal surgery when they moved the muscle/skin/fat UNDERNEATH my skin, and tunneled it up to create the breast. So again, nerves severed, reconnected. It was going to take time....meaning months...for things to get back to normal. The doctor recommended a homeopathic cream called Arnica that would help with the healing/brusing. On the way back from the doctor we went to Target to buy the compression undergarments...and to Whole Foods for the Arnica cream which I bought in gel and cream form. I have to say that it has been helping, just a bit...but it's better than taking Tylenol for it, which was pointless. Sooo....I'm home...and trying to clean house a little. Not very easy when you can't bend too well. But I'm trying to do what I can. Everyday gets a little better. My next doctor's appointment is not for another four weeks! So if you'd like to support us: http://info.avonfoundation.org/site/TR/Walk/LosAngeles?px=2246507&pg=personal&fr_id=2060 Only 121 days left! I've been off work for two weeks now. Being that I'm not a big TV watcher, this gives me a lot of time to think. I've been thinking a lot lately about cancer, illness, the beauty of prayer and friendship, blogging, going public, and sharing. It was really a big decision for me to "go public" with my breast cancer, putting it up here on the blog page. But I'm really glad that I did it. It's really been helping me to write down my emotions, thoughts, even just my day to day here on these pages and sharing them. I'm usually a pretty private person. I share, but I share with those that I am super close with: my family and perhaps one or two close friends. In the beginning I didn't want to share with everyone, because I was afraid of negativity, suggestions, and the worst part - having to discuss the same thing over and over with various people. But the reaction I've gotten to going public has been so opposite what I thought: have gotten only positive feedback. I've have received encouragement and prayers from readers, and because people are informed of the day-to-day online, my fear of having to repeat the gorey details over and over just hasn't come to fruitition. Cancer is scary. As much positivity as you may have, and as much faith as you may have, there is still the reality that you are not in control. Having faith means that you don't let the fear control you; but it still doesn't mean that you have control of the illness. And that's difficult....especially for someone who likes to be in control, like me. Sharing all this has been helping me. Telling people has been good. Sharing. It's not just sharing on a happy level. It's sharing on all levels: sad, discouraged, frightened, joyful, hopeful. I'm normally a pretty "up" person. But I do have my days (as you all know). Sharing lets everyone in on those days too...something that I wouldn't normally share, but something that is definitely part of me as well. And this is good. It's good for me to see that I can share this part of me, and still have people around that encourage me and cheer me on. So I thank you all....for letting me share. For your encouragement, your prayers, your comments (which I love). Thank you for helping me through all this. And for sharing my sharing with others. Today is my two week surgiversary. I have to admit that I didn't think the pain would last this long, but here we are into two weeks. I have areas of hypersensitivity that are making my skin crawl. My ab incision is healing, but there are periods throughout the day where the pain makes me come to a stop. The bruising througout the chest and ab area is getting better...a shade of yellow-green now. My drain numbers were still too high to go to the doctor today. My appointment had to be rescheduled for Wednesday. Try as I might to take it easy, I still can't get the numbers below 20cc. 's per day....that's the magic number for drain removal. And I'm still really swollen. It's getting better, but still there. I got dressed in my regular pants today (not sweats). I couldn't button them, so kept the zipper open, and the waistband pinned together (open) with a big shirt over the whole mess. We ran a couple errands together and that was about all I could do. Came home really tired. But still, I'm grateful...the surgery is behind me. I made it through. The cancer was removed with no nodes involved. It's good. Gamatz Gamatz (slowly, slowly). I'm getting there. It's just going to take patience. When I first got diagnosed with breast cancer this time around, everything came to a screeching halt. I had so many things going on in my life, and this was just the tip of the iceberg. One more thing to deal with...but a scary thing to deal with. I mean, it wasn't just not meeting a deadline...it was dealing with my own health/life. One of the good things about all this (and yes there is a good side) is that cancer causes you to STOP and assess your life. You really figure out what is truly important to you. You look at every day as a blessing. And you learn to weigh things out a little....keep track of your priorities. And there's all this uncertainty. In fact, everything becomes uncertain and you lose the ability to be in control of things. Yes, your biopsy came back positive for cancer, but then you have to wait for pathology results...when? You don't know. You're in limbo, waiting for someone else to give you the news. Once you get the pathology report, then you have scheduling to deal with...more tests, surgery, hospital, labs, etc., and once again, you're not in control, but the scheduler, the insurance company, hospital, whomever is. Because of this, I find myself setting mini goals, pushing myself to meet them. I remember when my grandmother was alive, she would do this: "God willing, I'll be alive when you graduate high school." Graduation came and went. "God willing, we'll make it to see your engagement..." Weddings, luncheons, Mother's day, celebrations, Christmas, Easter, etc. This time around, I found myself setting the goal of my daughter's graduation. On June 12 she'll be graduating nursing school. She's speaking at her graduation, and I found myself telling each of my health care providers that we needed to do everything STAT because I had a graduation to go to and didn't have time for this! Receptionists, surgeons, anethesiologist, nurses, coworkers, insurance customer service people...everyone knew that "this mom needs to be well and present at her daughter's graduation." And they heard me, and they made it happen! Today is May 14. Surgery was 12 days ago. And it looks like I'm going to be able to make it to graduation after all. (Hopefully, I'll be able to dress normally...still have incisions that don't make that possible.) I'm looking at life so grateful right now. I'm looking forward to being there, watching my baby reach this important milestone. I thank God for my life, and for the technology that we have available today to detect cancers. I am truly blessed. I am a two-time breast cancer survivor, and a colon cancer survivor. And once we get to the graduation goal...there's a new goal. The breast cancer walk...and all the training/walking/fundraising. One goal to the next. One day to the next. One minute to the next. Every day, every minute, every second is a blessing and something to look forward to. Life is a blessing. 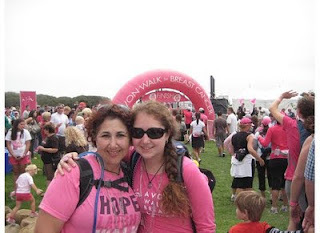 Ani and I have signed up to walk in the Avon Walk for Breast Cancer - Santa Barbara. Training to walk the 39.3 miles in two days is going to be a challenge - but easy, compared to the fundraising aspect of it. Each participant has to raise $1800. In order to help us fundraise, I've designed a line of Pink Ribbon jewelry. Right now, I have ten created/listed. I'm ten days post op today. The treat of the day has been the ability to shower! Woot! Following directions to pack drain sites with bacitracin, suspend my one existing drain around my neck, it was all soooo worth it. Then you have to reverse the steps when you get out, carefully drying and redressing. I got out a clean and happy camper...but a tired one. I've been dealing with AFLAC this morning. Apparently, before I went in for surgery, there was one form that didn't get completed...so I need to deal with that. I've been working on the breast cancer bracelets and need to photograph and list them online for all you nice people that had an interest in purchasing one. One of the cool things I've noticed is that my kitties know that something is up with me. They usually fight for my attention, Zelda sitting on my lap, until Mati comes to take over, intimidate her with his bad self, and get her to run off so he can take her spot. Since surgery they have been very careful. Zelda will perch herself on the couch cushion behind me and lay her head on my shoulder from behind. Like a black kitty corsage. Mati, the big bad boy kitty, will sit right next to me and only put his paw on my lap. (This is a good thing since he is an 18 pound bad boy). It's amazing to me that they know. Back from the Doctor - Good News! Two doctor's appointments today, both great! Thank God! Doctor Carvajal gave me the good news. There is no residual cancer - they got it all. And he was able to remove another 7 lymph nodes during surgery and all 7 came back negative for cancer! And I have a 95% chance of total cure! Yay! Doctor Berger said everything looks to be healing really well. He was able to remove two of the three drains, and the best news...I can shower!!! Woohooo!!! Everything is looking good. He said the healing is going to take time. Maybe we can have the third drain out by Friday, if not, early next week. No lifting still because a mesh was put in the abdomen where the muscle was taken out, and that will take time to heal. And I got the okay to walk...though not too far yet. It was a really good day (despite the discouraging start....did I really write that post this morning?) Thank you everyone, for all the prayers and love! God is good...always. Can I Vent for a Moment? It's another beautiful day in sunny Southern California, but I woke up feeling discouraged. Tired of sleeping in one position. Tired of my back hurting. Tired of having drains coming out of my body - and having to empty them, log them...etc. Tired of not being able to wear clothes because of my incisions. Tired of not being able to shower! Tired of not being able to wash my own hair. .......Okay, I think I'm done for now. Remember when I said it was a beautiful day out today? Well, Ani came home saying the same thing. She had just taken her ATI exit exam and had been staring at the computer all afternoon. She came home and asked if I wanted to start our training today. I want to...but on the other hand I'm not supposed to do anything to elevate my heartrate for now. But the sunshine was too hard to resist. When I told Ani that I'd have to figure out what I can wear...she said, "Just go like you are. It's not like we're going far anyways." Now any other time, I totally wouldn't have done it. BUT I am a two-time cancer survivor here!!! And can do whatever I want, whenever I want (okay, within reason). So off we went, with my pink, purple, gray floral pajama bottoms, my hot pink "Survivor" shirt from last year's Avon walk (no bra mind you! ), my 70's Onco fannypack with my drain tubes hanging out of it. And everytime a car would go by, I'd cover my face and say, "Nobody look at me!" We went one block. And on our way home, walking toward us was a guy that takes the same bus to work that I do...I'm mumbling to Ani, "oh no....I know that guy...." Ani says, "It's okay, just keep your head down...." And then right when we were passing each other, I looked up, made eye contact, and said, "Hi!" First training walk: One Block, One week and one day after cancer surgery. Days to the Avon Walk for Breast Cancer: 130! May 10....Guess what I was able to do today? I was able to give myself a sponge bath. Woohoo! The range of motion in my arm was a little better today. Still, it wasn't easy. Ani was studying for her exit nursing exams this morning, and I didn't want to "ask" for help. It made me feel like we're making a little progress here! I so appreciate everything that I can do for myself -- again, that thing about asking for help. I still have absolutely no feeling in my new breast, chest, waist, abdomen. It just feels like one giant eraser. Think of the feeling when you have a filling at the dentist and your lip is all rubbery and weird? That's what my body feels like from the hips up. And my right upper arm feels super sensitive to the touch. Anyways...despite this weird feelings, I did get to wash myself today. Yay me. That's big time! My mom is over today. She came over with a ton of food that she chopped up and threw into the crock pot. It's cooking. I'm sure we'll be eating it for DAYS!! But I'm grateful. We get to spend time together, and watch all these shows that I never watch -- Oprah, Dr. Phil, Dr. Oz. It's very sweet because despite her arthritis and aches and pains, she leaves her own comfort and comes over to take care of me. She's the best. Tomorrow is my doctor's appointment with both doctors. I'm hopeful that the pathology report will come back negative for lymph node involvement (which means no further treatment). Here's to hoping! One Week Out and Ready to Take the Next Step ....Literally! It's Monday, May 9. I am one week post-op from mastectomy and tram flap reconstruction. I've leaned a lot over the past week about the procedure, how to listen to my body and how to take care of myself. I've also taken some strides to get myself up and healthy. A week ago, I didn't really know what to expect. Yes, the doctor said he was sending me home with drains attached...but I didn't know to what extent. Eighteen years ago, I was discharged with one drain under my arm, emptying me of the lymph from the node dissection. Today, I still have three drains...one on my side to drain the excess fluids from the mastectomy and the newly constructed breast, and then two in the lower abdomen area to drain the surgical site where muscle, fat and tissue were taken to create the new breast. I have to monitor this drainage (which is not nice), emptying the drains into a measuring cup and noting the cc's from each site. I have to keep a drain log which I call in to the surgeon's office. I've learned to listen to my body. I've not ever been a "nappy" type of person. But after this surgery, let me tell you....I nap. The Vicodin kicks in after about 20 minutes, and I need to nap. When I haven't been able to, because of family, etc., I can feel it. The rest helps me heal, and I actually think I'm doing better because of the napping. I think the hardest thing to get used to is allowing myself to rely on others. I have never been very high maintenance, and I've never been going at asking for help. After surgery I have no choice. I can't bend. I can't drive. I can't move quickly. I can't shower or wash my hair. What I CAN do is ask. This is not easy, but unless I want to get my hair washed, I have to ask. Sponge bath? Ask. You get the idea. Not easy, but necessary. These are the names of those we walked in honor and memory of last year. We carried these names with us on our packs every step of the 39.3 miles! Help us take the next step in breast cancer. Here we are at the Avon Walk 2010 after crossing the finish line. It's incredible to participate in something so powerful....and to do it with your daughter! Because of walkers who walked and raised awareness before me, I am alive today! And grateful! It's Mother's Day today, and it's coming to a close. It was a wonderful day, but different. I missed going to church with my family. And I missed being all together with my mom, sister, brother and their families. But it was a nice day, just different. The plan was that Nareg would bring over Thai food and that Ani would make dessert..and we'd sit on the couch, vege and watch Harry Potter. That's what we did. The food was great, the dessert was beautiful (and yummy) and the movie was suspenseful. Throughout the day, while talking to the family, or on the phone with my brother, I caught myself saying "don't make me laugh....it hurts to laugh." Holding my gut, I'd lean over and brace myself. But the response was always, "YOU'RE the one telling the joke...you're doing it to yourself." It made me realize that it really was me. That despite the major surgery, this terrible disease and all that goes with it, life was still funny, and good...and being with my family was really the best possible medicine ever. It was a good day. A really nice fun day. I missed my mom who was at my brother & sister in law's house. And she missed being with us as well. But there is always tomorrow. Tomorrow is also Mother's day, and the next day, and the next day! She's coming over tomorrow. I'm so blessed. Happy Mother's day to all the mom's out there -- especially the Best Mom...My Mom -- who has taught me so much about love, faith, hope, parenting, prayer and compassion. To my wonderful children, Thank You, for blessing me with being your mom. I love you both so much. Thank you for a great day...and for the laughter and smiles. I had an appointment today to get my pain pumps and dressings. Pain pumps are these fat grenade-like balls filled with pain meds, and they are sutured into your skin and distribute medication into your incision. Along with your drains, you carry around a pouch with your pain pumps...and as the meds are used up, the grenades become smaller. So today the sutures came out and the tubing was pulled out of the incision....and pulled, and pulled and pulled. It was wild...maybe 15" of tubing X 2 were removed. Apparently, the tubes have holes in them (kind of like a tiny irrigation hose) and the tubes are laced throughout your incision to give you pain relief. I do miss the pain relief, but I don't miss carrying them around. My abdominal incision was unwrapped today as well. It's healing really well, but I look like Sally from Nightmare before Christmas with a zipper of stiitches going from one hip to the other. The drains are still doing their thing and will remain in til at least Wednesday. The breast is bruised but healing fine. And I'm still really sore and hurting, on pain meds, and unable to do much. Along with all this, I wanted to write a little about comments. I know it's really awkward when talking to someone who has cancer, or has undergone surgery because of cancer. But as difficult as it is, it's also hard on the person. I talk to family and friends on the phone and I get comments like, "You sound great! You sound so energetic and happy! I'm glad you're doing so well." Or something like that. I know the caller has good intention. But the truth is, you don't feel energetic and happy. You've had a body part that you were born with cut out of you. It hurts to sit down, stand up, walk, lie down. Emotionally, you have highs and lows. You have had cancer. Is it in the past? Did they get it all? Will the pathology report show more in the nodes? Yes, there's relief because the surgery is behind you. The worst is over. But now there's a lot of healing to do...physically and emotionally. So as encouraging as the comment may seem, it's really not as comforting as intended. So what do you say? Just ask, "how are you feeling?" And listen. Ask if there's anything you can do? Pick up anything from the market? Help with anything? And unless you're immediate family, wait a few weeks before saying you want to come over for a visit, and understand when your idea to visit isn't met with the same enthusiasm. I know in my case, I can't even get dressed most days, let alone pick up my house. The idea of having visitors is too much at this point. Lastly, know that your friend loves you, and appreciates your friendship so much, but this thing that she's going through..it's not always black and white. I'm moving slow. Getting in and out of bed is tough. Sleeping in one position all night, propped up, is a killer on the back. The tram flap procedure of reconstruction tunneled muscle and fat up to the reconstruction site. "Tunneled" ...weird. And painful. I am numb from the new breast through the chest area. Bending at the waist is impossible. My abs are sore, and the tape from the bandages is itchy and irritating. My tummy is bandaged...I haven't seen that yet. On the positive side, I'm walking better...not so slow, not so hunched over. I go to Dr. Berger's office tomorrow to get the pain packs removed (two less tubes! yay! !....and no more purse o' meds to carry around). But what am I supposed to wear? Right now I have PJ bottoms on, a tshirt with three drain (grenades) pinned to hang from it. It's hot out. Sweats and sweatshirt is not going to do it. A dress with the drains underneath? Maybe. It's only for another week or so. Monday morning, I checked into the hospital. The usual prep, anesthesia, and then you wake up having had surgery and you lost track of your life for the time you were under. I remember being in recovery and it being 5:30 in the evening and being so surprised that so much time had gone by since surgery began. And now, day 3, Wednesday, and I can't believe that it's behind me now. The healing has started. While in the hospital, you're in this kind of "funk". The morphine keeps you sedated and somewhat painfree. Family and friends come in and out with flowers and support and it all becomes kind of a blur. Was it Tuesday that they came? or Monday evening? The nurses come in and out too, checking your vitals, giving you meds, checking your bandages. And then this afternoon, they said I could go home. It's day three. I'm hardly well. I'm still bandaged up, I've got drains hanging out of me, and a "pain pack" that I have to carry around in a little black purse. The incision areas are numb, but going home sounds so great. The ride home was painful. Every bump in the road was felt. Walking up the steps and into the house, greeted by the kitties who knew something was up. After dinner tonight, I went out into the garden to look around. The tomatoes and peppers looked the same, even the zucchini...same. But the peas! I had planted chinese peas last week, and wbile I was away, they decided to sprout and poke through the ground. Life goes on. Today is May 1. It's the eve of my surgery. 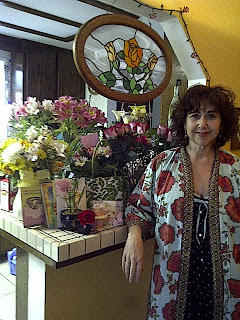 It's hard to believe that my annual mammogram was just a little over a month ago. So much has happened. Almost 18 years ago, I was diagnosed with breast cancer. At that time, my children were young, 6 and 12. I was only 34. My life was turned upside-down. Initially, my surgeon said we should do a double mastectomy. He said at my age (young for this diagnosis), the chances of recurrence were greater, so it would be best to remove both breasts as a preventative. But the oncologist I went to for a second opinion disagreed. After reading clinical trials, getting more information, we came to the decision that I would have a lumpectomy and a daily six-week course of radiation therapy. I did. And I survived. Of course, that wasn't the only treatment. It took a lot more than that. The love and care from my family and friends, the endless prayers that were said for me, and the belief that those prayers were being heard and answered. And positivity. Eighteen years have past since then. I've been an advocate for breast cancer issues. I've walked the walk (literally, countless miles in breast cancer walks)...and talked the talk, dragging friends and loved ones with me. I've made friends because of breast cancer, and I've lost friends that have lost the fight. I've been vigilant about my annual mammograms. And I've been thankful for every single day of my life since then and for every report I get back each year saying that my films came back normal. This year, I got a different result. Instead of the "all clear" letter, I got a call back. They needed me to come in for more views. The doctor had found an "area of concern". The further views warranted a biopsy, and within a week, I was diagnosed again with DCIS...same as last time, except this time, there were some areas of infiltration. The good news: It's early stage yet. The bad news: Because of my past history with cancer and radiation, I will need to undergo a mastectomy. That was only a month ago. Since then I've had to meet with the surgeons, deal with insurance, submit paperwork for my disability leave and FMLA, get my work in order for my leave, have MRI's, and appointments, etc. Basically, it's been a "Calgon-take-me-away" kind of month. I have had to tell my family (of course) and listen to their concerns, fears, hopes, encouragement. There have been countless prayers said, and I am touched by the texts and emails that I have gotten tonight by friends and family who are lifting me up in prayer and good thoughts. Although I did tell my family and a few friends, I decided not to share this news with everyone. I've debated about it. Why not? I suppose it's that "look" of sadness that comes over people's faces when they hear the "C" word. And then the tone in their voices. I didn't want that. If I'm going to fight this, I need to surround myself with POSITIVE ...and only positive. I need to be in my best game. But the other part of me wanted to share. Why? Because I know that I'm not the only one going through this. I know that there are women out there who are going through it now (or maybe kids whose moms are...or aunts, sisters, even fathers and brothers)...and don't know if they'll make it. And I wanted to offer them some hope. On this eve of my surgery, I decided to go public. Round Two...I'm ready! I'm in a different "head" now than I was 18 years ago. I am stronger in my faith. I am healthier (despite the cancer), and I've been through it before. I don't have that "fear of the unknown" thing going on, although I am not looking forward to the pain of recovery. I am not afraid. I have hope. I have love. I have faith.